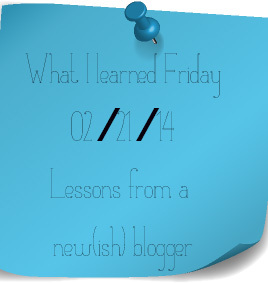 If you’re new around here, each Friday I write up a handful of lessons I’ve learned in my blogging-world that week. Thanks for stopping by! 1 – As you read last week, Amazon’s Affiliate program is now open to North Carolina residents! 2 – I signed up for the affiliate program – and have been messing around adding some links here and there. It’s actually very simple to do, and plan to do a whole post on the program once I learn more of the features. 3 – You’ll notice an addition to my signature (below) that includes my affiliate disclaimer. I added this to my signature that I created in ‘Simple Content Templates’, which makes it easy to have the same signature on every post! 4 – Did anyone else’s numbers nose-dive in January? I’d read that they would – but I didn’t expect them to that much. For those who have experienced the January – slump before, when do numbers typically rebound?